The blade itself incites to deeds of violence – Homer (not Simpson – the Greek one). A beast of ill-contained rage and terrible strength, the Helbrute known as the Ironghast Fury was sent to Kell as a gift from the masters of that terrible hell-foundry. The reasons behind this action however, remain unknown. Was it intended merely to secure ties and future tribute from his warband, or to encourage him to abandon other gods and devote his service to Khorne alone? Or does it serve a more subtle purpose as the weapon by which this errant chaos lord might be destroyed? After all who could contain such violence as this creature seeks? Perhaps the mere possession of such a weapon would tempt its wielder to seek war on such a scale that, in the end, he too shall be dragged down into destruction and defeat. Whew! With October (and more importantly DreadTober) almost over my converted Helbrute is finished – and with only a minimum of late nights needed to work on him. Here’s how he looked earlier in the week. As you can see the metalwork was started but the whole model was still looking rather unfinished. I’m not quite sure what possessed me to make the spine quite so hideous – my logic was that with all those tentacles flaying around it would be putting terrible pressure on the anatomy of a creature that is, after all, not the result of natural evolution but instead produced by random growth. Don’t feel sorry for it though – it’s a monster! I know it’s subtle but I’m rather pleased with this little detail on the base. Take that Blood Angels – you think your Dreadnaughts are angry?! By the way, for those who’ve not read the Khorne Daemonkin book, the Ironghast Foundry is official cannon, a whole planet given over to producing weapons for Khorne’s armies (put that in your pipe and smoke it Skullgrinder!) Sadly the description becomes rather melodramatic even by GW’s standards (boiling blood and murderous skull covered machinery everywhere), and their imaginations ran out entirely when it came to the man in charge – a ‘cruel and violent’ character (no-one expected him to be easy-going and jolly) known only as ‘The Overseer’. Leaving that aside however I rather like the idea of a massive Khornate forge (the name Ironghast just sounds mean doesn’t it?) and wanted to sneak a reference in to my own collection somewhere. Now hopefully by the time they get round to making another edition of Khorne Daemonkin the Overseer will have fallen beneath the bone pistons of his own horrific engines and been replaced by someone a little more nuanced. 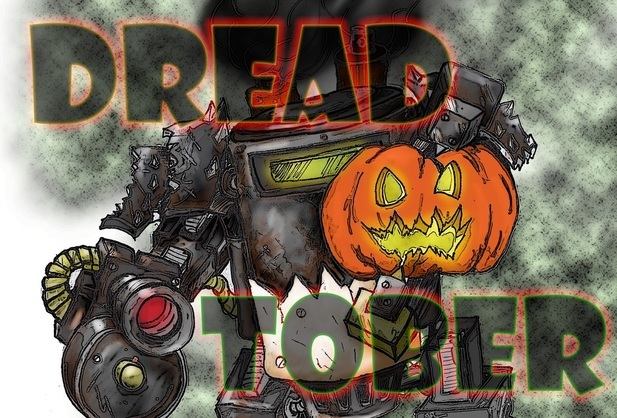 Anyway, moving on I’d also like to add that DreadTober is the first event of its kind that I’ve ever taken part in and it’s been a hugely enjoyable experience. Not only has it encouraged me to get this Helbrute finished (saving it from another year sat in dusty shame on the painting desk) but it’s also been a great opportunity to see other people tackling similar subjects. Once again then I’d encourage anyone who hasn’t already favourite the main site to get over there and have a look. Also, in disgustingly clichéd Oscar-winner style, I’d like to offer a quick thank you to Greggles and everyone else who made DreadTober happen, and to everyone who got involved. It made it a far more exciting thing to be part of than had I simply challenged myself, and the outpouring of creativity from the other participants was extremely inspiring and motivating. So cheers guys, and if anything like this happens again I’ll be sure to join in if I can. One of the first to join Kell in rebellion Zo-Kalar is now perhaps the oldest, and most ambitious, of his senior lieutenants still surviving. Having wisely avoided the petty internal rebellions of the early days that saw many of Kell’s rivals interred in Helbrute sarcophagi Zo-Kalar has managed to remain close to his master, serving both as an advisor and a trusted field-commander. Yet Zo-Kalar has not simply exchanged servitude to the Imperium for the chains of another. He seeks a loftier goal than mere conquest; immortality and Princedom in the Immaterium, and he will shirk neither danger nor shame to achieve it. Another nice thing to come out of #DreadTober, beyond seeing all the inspiring work others are producing and working on a Helbrute of my own, is the push it’s given me to finish off outstanding projects – including one that’s been cluttering the painting desk for far too long. I bought the Dark Vengeance set as soon as it came out and set about the Cultists and Helbrute with gusto. The Dark Angels contingent were intended to join my Space Marines chapter, or perhaps form the basis of a small group of allied Dark Angels, but so far both projects seem to be on indefinite hiatus. I never really got started on the Chaos Lord or Chosen either and whilst the latter are still lying in an unassembled heap somewhere I’m proud to be able to show off the former at last. I know he’s ‘just’ the Dark Vengeance Chaos Lord, without any conversion to speak of, but have you looked at this model lately? Like much of the starter set it blew my mind when it was first released. Three years on and I hardly look at it twice. It wasn’t until I decided, pretty much on a whim, to get on and assemble it, that I realised all over again just how damn good it is. Just look at the sheer level of detail in this model; the screaming faces in the armour, the mouth on the helm, the spine in the backpack, that sword! Of course, I have also been working on my #DreadTober pledge; this Helbrute. As you can see the metalwork and armour is now mostly filled in. Still, with less than a week to go now I’m not entirely filled with dread (boom boom) but there’s still a lot to be done if he’s to be finished in time. Here goes! So, with all the attention Khorne’s been getting lately, it might seem that I’ve been stubbornly looking the other way and saving all my lovin’ for Nurgle. However that’s not quite true. My excitement about the new followers of the Blood God, some of which are simply excellent (others less so – I’m looking at you Anvil-Guy!) led me to crack on and get my Khornate Dark Apostle finished. Here he is, ready to consecrate the skulls reaped in the War-God’s name. For those interested in finding out a little more about his origins as an unassuming lump of grey plastic the place you need to go is here. Continuing the Khornate theme I’ve also started work on the flailing monster that is my contribution to #DreadTober (for the full story click here or head over to the main site for a feast of creative inspiration). So far he’s just had the first few coats and washes applied to the flesh areas although since I took these pictures I’ve started on the process of tidying up ready to fill in the metal. To my eye he looks distinctly rough and ready but I’m no fan of showing my own WIP shots to begin with! I’m coming rather late to DreadTober but I’ve been watching from the sidelines for a while. Now, with half the month already gone and a track record for taking my time with larger models, I’ve decided to jump in. Some people may think this is rather foolhardy… and they’d probably be right. For those not in the know DreadTober is an online event the aim of which is to paint a Dreadnaught (or equivalent Deffdreads, Helbrutes, etc) by the end of October. Again, I’m aware that it’s already the 15th – you’re making me feel pressurised by bringing that up all the time you know! Stop it or you’ll make me cry! 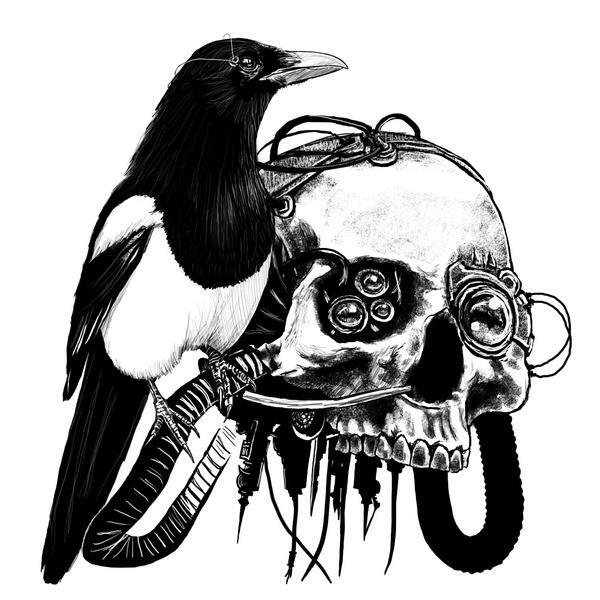 Anyway, if you want to be inspired head over to the site itself and check out some of the extremely impressive and creative work that’s going on there. I’ve decided that my challenge will be to paint this monstrous beast who’s been glowering at me from the corner of the painting desk for altogether too long. I first showed him in this post from last November so, in spite of my slight embarrassment that this was nearly a year ago, it seems nicely circular that I should now be aiming to get him painted by the end of October. Hopefully this will serve as the inspirational spur that finally gets me started and turns him from an unattractive lump of grey plastic into a debonair inhabitant of the 41st Millennium. As if the bar wasn’t set high enough already I’ve discovered that he’s now rather worse for wear – thanks to a recent house-move several of his tentacles have broken off and some have disappeared entirely. So as well as getting him painted I’ll need to patch him up as well. Oh, and take some work-in-progress shots to document his progression (something that regular readers will know I avoid like the plague!) Here goes! Show ’em You’ve Got Guts! It’s hard to believe but today the Putrid Blightkings are one year old. In that time they’ve become a firm favourite of hobbyists, making their way into Nurgle armies around the world. To celebrate our fat, evil baby’s first birthday I’d like to take a look back at what I’ve managed to do with the kit over the last year. However this isn’t just about reminiscing so let’s set the ball rolling by showing something I’ve actually managed to finish off – the first of my Chosen of Nurgle. I mentioned when I first built him that I felt I hadn’t been that adventurous in converting him but now he’s finished I’m glad I stuck to my guns (or in his case simply stuck a gun to him). As a model he already stands out as a simply fantastic miniature so any wild or elaborate conversion work just wasn’t needed. And, as we shall see, I have managed to get a few crazy conversions out of the kit. He’s joined in the squad by these two chaps (still awaiting paint). I’m still planning to make two more for a complete squad, and yes it is embarrassing that I’ve only managed to build three despite having had a year to work on them. Thanks for mentioning that in front of everyone. Jeez! When the Blightkings were first released I waxed rather enthusiastic about them, rattling off a list of ideas that probably meant next to nothing to anyone beside myself. At one point I claimed that I could foresee using them “or all kinds of Nurgle worshipping characters, ranging from Sorcerers and Dark Apostles up to a Daemon Prince”. Now the Sorcerer remains to appear, and the Dark Apostle ended up looking like this instead, but the Daemon Prince is finished at least. He’s far and away the biggest and craziest thing I’ve managed to create from the Blightkings so far, as well as one of the most nerve wracking things I’ve ever put together, but the end result remains one of my favourite miniatures in the collection. You can read more about him here. In my review of the kit I went on to suggest turning the Blightkings into Plague Ogrens or Nurgle Obliterators although once I had them in hand my suspicion that they were far too small was confirmed. I went on to suggest however: “Another possibility, and one which serves to balance out the size issue, would be to have one or two Blightkings wired or grafted into a motile, semi-sentient weapons platform.” My idea was for something not dissimilar to this demented contraption (and if you want to know more about it the place to look is here) but with the pilot physically wired in as with a Dreadnaught. Anyway, this idea stuck with me and, although the original (fairly weird) concept has yet to see fruition, it did lead to the evolution of this rotund gentleman. You can find the story of how he came to be here and here. Having discounted using them as Obliterators for the moment (and by the way Games Workshop, one year on we still don’t have decent models for them) I started thinking about what else they could be turned to. I already had the feeling they’d be too big to use as normal Plague Marines and so I started considering making Nurgle Possessed instead. As it was this idea evolved into the Nurgle Chosen you see above. One thing that’s worth mentioning about the Blightkings, and makes them quite unusual, is the diversity in size of the heads. It’s worth noting here that there are 17 of them (I‘ve not counted them, Games Workshop’s advertising blurb told me so and they would never lie to me). These range from chunky bonces that look big on a Terminator, to little pin-heads that fit a guardsman. This is rather handy and allows the heads in the middle to be used on Plague Marines like the ones below. However it’s also worth being aware, especially if you’re buying a specific head separate from the rest of the kit through one of the third party bits sites. I also said that I didn’t expect Gutrot Spume to be nearly as popular with convertors and, in my experience, this has proved to be correct. Having said that I’d still be curious to see what can be done with the model if it was brought into the 41st Millennium so if you know of any good conversions put a link in the box below. The one thing I’ve not talked about much here are Nurgle Terminators, although many of the Blightking parts are a neat fit for this. My reticence is, in part, because my own efforts to make Nurgle Terminators based on the Blightkings hit the wall in short order and have yet to really bounce back. However I am starting to feel inspired in this direction once more so let’s give it some time and see what happens. In the meantime hopefully you’ve enjoyed this look back at the Blightkings one year on and, as usual, if you have any comments or suggestions, know of any conversions based on this kit you think should be showcased or just want to be congratulated for having bothered to read this far, let me know in the comments box below. Got a bit of an itch to work on some Nurgle models at the moment (should get that looked at I guess…). Sadly this hasn’t yet translated into painting up anything I’ve already built and instead I’ve kitbashed another new Chosen. As always feedback is welcome in the box below. Not as welcome as adulation, praise and general hero-worship you understand but if you think I can improve him come at me, I can take it!